work tirelessly to ensure the accuracy and completeness of our listings. So you can search with confidence knowing that every qualified supplier that can meet your needs can be found right here. IndustryNet is a service of MNI, the nation's oldest and largest compiler and publisher of industrial information since 1912. Learn more. We purchased $100,000 in building maintenance services, control systems & health seating with your guide. We use it regularly. We've recently purchased $5,000 worth of packaging through your guide. $27,000 of purchases in past 12 months through your guide. I purchased $10,000 in various industrial supplies using your guide, and occasionally use it for sourcing. We often use your guide to purchase lumber, hardware, boiler maintenance & supplies, recycling machinery & equipment, parts & maintenance. — M.O. Deviney Lumber Co., Inc.
capabilities to meet your needs. IndustryNet is designed to meet the needs of today's tech-savvy industrial buyer. 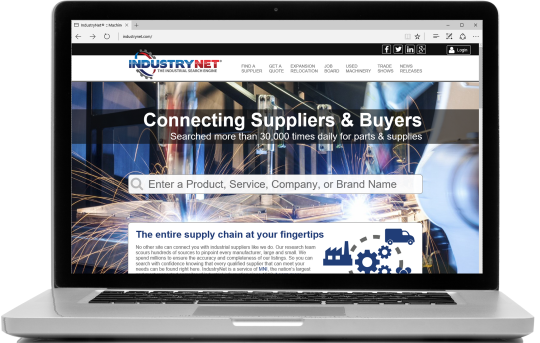 With IndustryNet, you can quickly discover new suppliers, save supplier searches, submit and review quote requests, create lists of prospective suppliers, attach private notes to companies, and more.